This ridiculously tiny instrument is actually a real piano, even though it only has 75 notes [ F1 to F7] It is 34″ tall, 51″ wide, and 18″ deep. 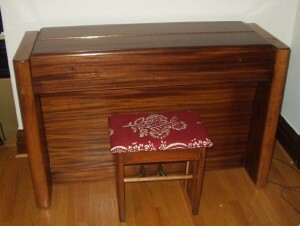 Gorgeous Art Deco case, recently refinished , with a matching bench. I have just rebuilt it with new strings, new keys, and new Abel hammers, and it has a surprising rich , full sound, with a brilliant treble and a growly bass. 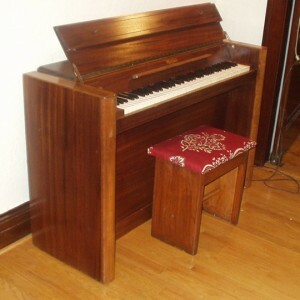 It’s a wonderful piano for a beginner , or someone with extremely limited space or and eye for Deco furniture. These little pianos were designed by an English company called Eavestaff, and manufactured exclusively in the US by Hardman Peck in New York. They are a unique design, and quite rare. $1800.